Lighten Up! slowly lights a bedside lamp to simulate dawn. This simulates sunrise and tells your brain that it is time to get up and start the day. Wake up the way nature intended feeling more refreshed. Humans are sensitive to light in the early mornings; it send a message to the brain that it's time to get up. Lighten Up! 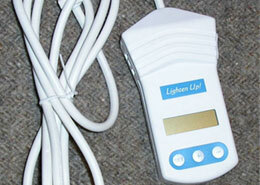 works with your existing lamps, no need to purchase expensive replacements or costly special hardware. Just plug it in and enjoy the sunrise. Compare our dawn simulators to others that cost up to six times as much.If you can plug a cord into a wall socket, you can program your Lighten Up! Set 205 or 308 for your preferred wake up time - 308 can adjust brightening cycle and stay on times for each day of the week. Adjust your daily sunrise to your own preferences. You can set the start and end times to wake up just the way you like it! Our simplest and most affordable model. Nothing to set or adjust. 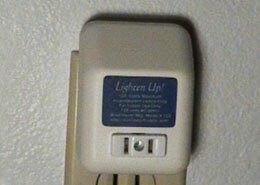 Just plug it in and wait for your daily "Sunrise".